44 • RV PRO • September 2018 rv-pro.com R V M A N U F A C T U R E R S COACHMEN Coachmen, Forest River's largest single division, is rolling out dozens of new models for dealers just in time for The Expo. Below is just a sampling of what dealers can expect to see. Sportscoach Sportscoach has waged war on "price creep." Representatives for the motorhome maker say they are pushing back against increasing margin pressure by debuting the Sportscoach 339DS. "We slowly surpassed the $130,000 and $140,000 retail points for basically the same diesel that just a few years earlier would have been $20,000 less. The challenge we face today is: How do we keep our entry-level diesel pricing under $150,000 and keep it there?" 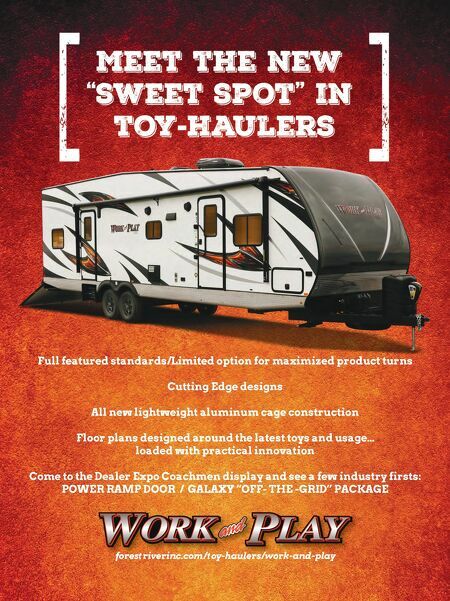 says Zach Eppers, national sales manager for Coachmen Class A Gas. Eppers says Coachmen managed to do this all without com- promising features, quality, or cutting corners structurally. The 339DS is still a 340-horsepower motorhome compared to others in the price range with just 300 horsepower. The motorhome includes Noble Select Gel Coat Sidewalls with Azdel backer. The 339DS features a flat floor throughout the coach with no step up into the bedroom. The front drop- down bunk in the cockpit area is the salon-bunk style that utilizes seatbelt strapping to raise and lower the bed in about 10 seconds. Other features include Bluetooth technology, which runs the sound of music or the outside TV through speakers incorpo- rated into the 18-foot power awning. Each coach comes with WiFi Ranger, solar prep, a diesel generator that slides out the front of the coach and a 2,000-watt inverter with auto gen start. Construction features unique to the Sportscoach include a one-piece fiberglass roof, 17-inch bus mirrors and full aluminum bus-style slam-latch compartment doors with a 1.5-inch dual- lipped automotive thermal-bulb seal and a 10,000-pound hitch. Another interesting feature on the 339DS is the inclusion of the "Coach-PAP" station located in the overhead cabinet above the king-size Serta bed, for customers who need to sleep with a C-PAP machine. There are still 110-volt outlets on each side of the bed, but the center overhead cabinet has an outlet and passageway to drop the hose down through to the bed. 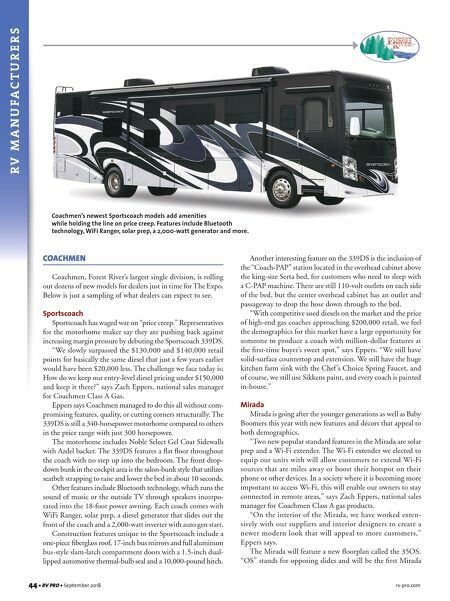 "With competitive used diesels on the market and the price of high-end gas coaches approaching $200,000 retail, we feel the demographics for this market have a large opportunity for someone to produce a coach with million-dollar features at the first-time buyer's sweet spot," says Eppers. "We still have solid-surface countertop and extension. We still have the huge kitchen farm sink with the Chef 's Choice Spring Faucet, and of course, we still use Sikkens paint, and every coach is painted in-house." Mirada Mirada is going after the younger generations as well as Baby Boomers this year with new features and décors that appeal to both demographics. "Two new popular standard features in the Mirada are solar prep and a Wi-Fi extender. The Wi-Fi extender we elected to equip our units with will allow customers to extend Wi-Fi sources that are miles away or boost their hotspot on their phone or other devices. In a society where it is becoming more important to access Wi-Fi, this will enable our owners to stay connected in remote areas," says Zach Eppers, national sales manager for Coachmen Class A gas products. "On the interior of the Mirada, we have worked exten- sively with our suppliers and interior designers to create a newer modern look that will appeal to more customers," Eppers says. The Mirada will feature a new floorplan called the 35OS. "OS" stands for opposing slides and will be the first Mirada Coachmen's newest Sportscoach models add amenities while holding the line on price creep. Features include Bluetooth technology, WiFi Ranger, solar prep, a 2,000-watt generator and more.